Unexpected stories emerge when you poke around in archives. The best laid plans often lead away from where you originally thought they’d go. Sometimes it’s because a letter that is mostly about one thing veers away to discuss a totally different issue (something that is all too familiar when I look at my own email inbox and try to find important materials by looking only at subject lines). Sometimes it’s because files themselves are opaque in their names—the document I’m going to talk about today is from a file simply labeled “current correspondence for 1843.” And of course it’s almost always because people, historical and otherwise, are themselves surprising. That’s how I felt about a petition that showed up in the Ivanovo estate records. I started reading it and then found it turned into a place I did not at all expect. At the start, I thought it was one version of a mother/daughter story, and then quickly realized it was not. From: Nastasia Danilova née Branina and married name Shelepugina, peasant wife of the village Ivanovo. My father Danilo Iakovlev Branin was sent away for resettlement from the estate sixteen years ago for reasons that I don’t know. After that I in my childhood remained with his wife, my mother, Tatiana Vasileva until I came of age and in 1837 I was betrothed to a peasant of the same village Ivanovo, Zakhar Kuzmin Shelepugin, as my mother Tatiana Vasileva gave me to him in marriage and I also agreed to the marriage. At the matchmaking the father of my then betrothed and now husband Zakhar, my father-in-law Kuzma Sidorov let me reside in my parental home in Ivanovo, to which my mother Tatiana gave her blessing that at our marriage we would live there and run the moveable and immoveable property. And so I lived with my husband with the above named Shelepugin for more than half a year and with us my mother Tatiana and with her her lover, the outsider peasant Ivan Kolobov from the village of Sedelnitsy of the estate of Pistsovo, who has been living here for more than ten years and who has an illegitimate daughter with my mother, Avdotia, who is twelve years old. My mother with him, Kolobov, have a business on bazaar days making simple cookies and cakes and various provisions and they admit people of different soslovie and due to these circumstances they create disorder. And I together with my husband have more than once asked the head of the estate administration to get Kolobov out of our house and there are decisions of the mir to do that but for some reason unknown to us Kolobov has continued to live in our house without paying anything. And so I together with my husband out of dissatisfaction with my mother and Kolobov living there unlawfully have moved out for a time and live in quarters and pay for that twenty rubles a year and due to that we suffer great need due to the current high price of grain and so to avoid this I most fervently petition the administration, do not take from me my legal inheritance, let me and my husband Zakhar Kuzmin live comfortably, we wish to be in the house and not in quarters, and to pay all our dues without fail and send Kolobov with my mother out of the house and we will live peaceably and not bother you with anything. The petition was signed on Nastasia’s behalf by her husband Zakhar (and the handwriting on that signature matches the writing of the petition enough to suggest that he might well have written the whole petition himself). Perhaps you can tell where I suddenly had a moment that felt like the proverbial record needle scratch? 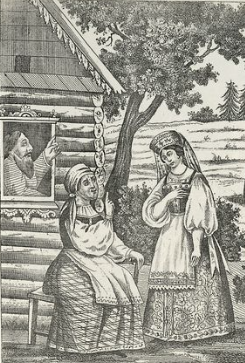 It was reading this peasant woman’s casual mention of her mother’s liubovnik, her lover. I’m not sure why that felt so unexpected, as I’ve run across more illegitimate children than I can count in the archives, which means there had to be a lot of lovers in peasant villages. But somehow coming across this mention seemed out of the ordinary—and then to have him turn out to be a baker was just icing on the cake (sorry). There are so many little bits and pieces to unpack in this one petition, so many elements of peasant lives. There’s the absent father, sent who knows where for who knows what reason years and years before. There’s the plight of his wife, not a widow, but alone nonetheless. There’s the presence of the lover/baker Kolobov and his long-lasting relationship with the widow Branina. Kolobov was probably lucky that he hadn’t gotten into trouble before. His home village Sedelnitsy (which apparently still exists) was just about 30 versts from Ivanovo proper which might have meant that he could live there without a proper plakatnyi passport. But, it was just over the border from Vladimir province, which meant that he ought properly to have had such a passport. According to the petition he’d been living in the Branin household for about ten years, but apparently had a longer history with Branina, as their daughter Avdotia was twelve (at least according to her half-sister, who by the tone of the petition had no particular warm feelings toward her). What bothered Shelepugina was not just the presence of her mother’s lover but instead the “disorder” they created by allowing “people of different soslovie” into the household. That’s a fascinating, suggestive phrase to me. For one, it reflects what lots of other sources say, that Ivanovo was a serf village in name, but a much more complicated place in practice. There were “people of different soslovie” drawn to the village because of its industry and its development, perhaps particularly on bazaar days, but more generally, as well. And it also makes this influx of people into a cause of disturbance and disorder for the native serfs. Having these people in the village was one thing. Having them in the house was quite another. There’s also another story in this petition, one of women and property ownership. That was a feature of my last post, too—Kirill Gandurin’s heir was his daughter Ekaterina. Here, another serf daughter saw her father’s property as her proper inheritance, and asked the estate administration for their help in ensuring her rights to it were maintained. This was clearly an accepted version of property ownership in Ivanovo, too—rather than having Nastasia come into his own family’s household, which was by all accounts the normal mode of peasant marriage, her father-in-law sent his own son into her household based on the idea that it was her own property and they would be running it together. That didn’t happen, of course, but was the basis of a peasant marriage that seems to go against peasant norms. Of course, as with so many of the unexpected stories found in the archives, there’s no clear ending to this one, at least not in this file. We do know that the Ivanovo estate administration took the petition seriously enough to investigate case. It discovered that there actual was no agreement of the mir to kick Kolobov out of the house or off the estate, but there was a general statement that “bakers from outside the estate” should be kicked out. Given that Kolobov was making a living selling cookies and cakes, that decision seemed to apply to him. Whether it was ever carried out, though, is another question. There were many people wandering around Ivanovo in this period, many of whom were not from the area, and many of whom had no particular business there. And as it turned out, there was relatively little the estate authorities could do about it. Next time, I’ll talk a bit about how that fact showed up in a particular investigation about vagrancy in Ivanovo.